A pattern is available for all of these quilts! Norwegian Winter (44" x 44") is a variation on my Star Chaser quilt that uses fabrics from the Winter Garden Collection by EBI Fabrics. Ice Stars is an easy to piece quilt. Made here from a yummy collection of colors from the Cracked Ice Collection and Crisp White and Stone Chips Sparkle from EBI Fabrics. Maple Swirl was created to highlight the beautiful "blocks" from the Maple Stories panel from EBI Fabrics. The blocks look like they are pieced, but in fact, the only part of the quilt that is truly pieced is the simple sash setting I created for them! 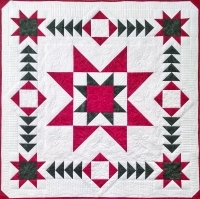 Star Chaser is a simple yet elegant quilt that can be used as either a table-topper or wall-quilt. I chose red and green for Christmas, but itwould be just as stunning in your favorite colors. 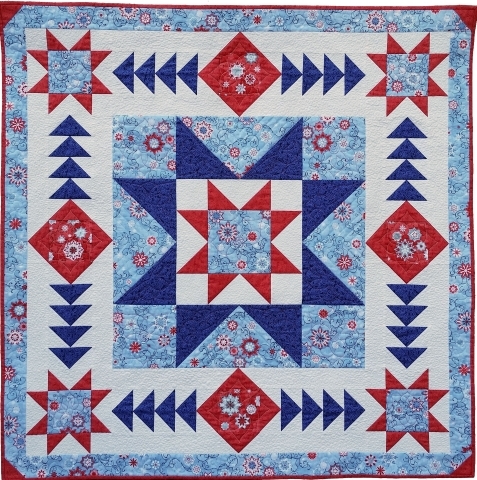 Friendship Stars and patriotic colors make this quilt easy and perfect for a summer picnic! Christmas Candy was first published in QUILT IT for Christmas 2007, a Quilter's Newsletter special publication. Dandelion Wine was created with Island Batik fabrics and was displayed in their Spring 2009 Market booth. 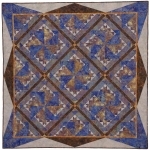 It was also published in the October 2009 issue of Mark Lipinski's Quilter's Home Magazine. This 2-block pieced quilt was made for my mother-in-law's couch in 2005, but quickly became my signature quilt as it was juried into several quilt shows and was featured in the November 2007 issue of Quilter's Newsletter Mgazine. Driftwood was also created with Island Batik fabrics. 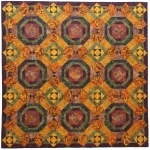 It also hung in the 2010 AQS Quilt Show and Exhibit in Lancaster, PA. While on display it was noticed by the editor of American Quilter Magazine and spawned which spawned it's crazy cousin Wild Daisy!